As a parent, our objective is to make child prayers as natural for a child as breathing. 1 Thessalonians 5:17 says that we should never stop praying. Encourage your child from the beginning to make prayers for children a part of their lifestyle. You can easily explain to youngsters that child prayers are a way they can constantly speak to their 'father' throughout the day. They can thank him for their blessings, praise him, lay their troubles or concerns before him, ask him for guidance or direction or make requests. Kids just need to know they can go to God anytime and should go to him all the time- no matter how minor the matter is. Make sure your child understands that child prayers are just a casual conversation with God about what is going on in their lives. They need to know that fancy grown up words aren't important to God. God just wants to have a relationship with them and to hear what is in their heart. As simple as that sounds; that is what child prayers are! One thing you may encourage your child to do is keep a prayer journal recording what they are praying about. Kids love to see progress and checking the journal from time to time shows them how awesome God is when he answers prayers for children. It can also help them understand that prayer happens in God's timing, not in ours. Books on Teaching Children to Pray As for older children, after they have committed some bible verses to memory, they can start incorporating those verses learned into their daily child prayers. This emphasizes that God's spoken word is very powerful and can really make major changes in their lives. 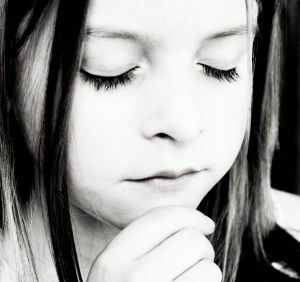 Emphasize that there are different types of child prayers: prayers of thanksgiving, intercession and prayers of petition. Each type of prayer is important and God expects us to be balanced in how we pray.